Pioneering Spirit is the world’s biggest heavy lift construction vessel under construction. Image: courtesy of Allseas. An aerial view of the Pioneering Spirit vessel. Image: courtesy of Allseas. Pioneering Spirit arrived in Rotterdam in January 2015. Image: courtesy of KOTUG. Pioneering Spirit will have a maximum topsides lift capacity of 48,000t. Image: courtesy of KOTUG. 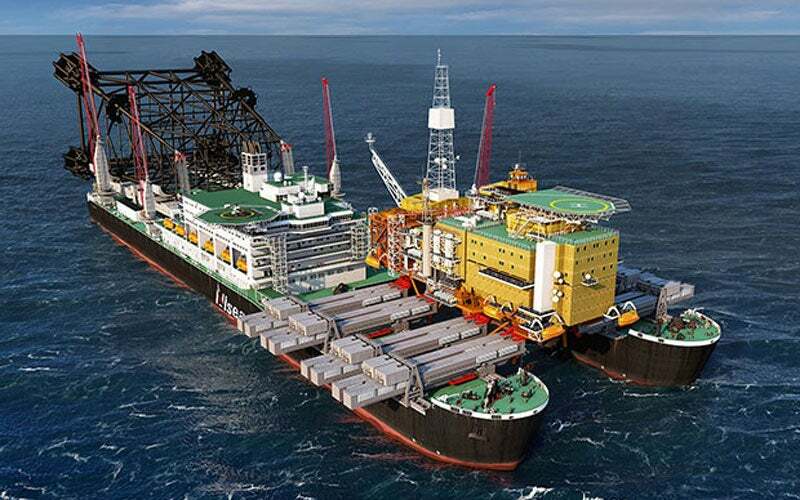 Pioneering Spirit, the world’s biggest heavy lift construction vessel, is under construction for Allseas Group, an offshore pipe-laying contractor based in Switzerland. Originally christened Pieter Schelte, the vessel was renamed Pioneering Spirit in February 2015. Allseas Group placed a €454.5m shipbuilding contract with Daewoo Shipbuilding & Marine Engineering (DSME) for the heavy lift construction vessel in June 2010 and received delivery in late 2014. The vessel arrived in Rotterdam in January 2015 for final assembly in Alexiahaven. The vessel is expected to enter service in the first half of 2016 with the deployment at Talisman’s Yme platform in the Norwegian North Sea. It will be capable of performing single-lift installation and decommissioning of large offshore oil and gas platforms, and installation of subsea oil and gas pipelines. Deltamarin was awarded a contract to provide detailed design covering naval architecture, structural and system engineering, as well as accommodation of the Pioneering Spirit in February 2010. The vessel incorporates a catamaran hull design integrating a dynamic positioning system and motion compensation system. Its forward hull features a slot, which is used to lift topsides. Detailed design of the hull was concluded in May 2010. Pioneering Spirit has an overall length of 382m, breadth of 124m and a depth of 30m. It will have a topsides lift capacity of 48,000t, jacket lift capacity of 25,000t and pipe cargo carrying capacity of 27,000t. It will accommodate up to 571 personnel in two berth cabins. Swan Hunter provided assistance for concept development and structural and outfit engineering of the vessel. The forward bow section will offer a 122m x 59m dedicated slot for lifting topsides using eight horizontal lifting beams. The aft side of the ship will feature two tilting lift beams for installing and removing jackets. Beams can also act as cranes for performing the installation or removal of modules and bridges. The deck will be installed with three pipe transfer cranes, each with a lift capacity of 50t at 33m reach, and a special purpose crane with a lifting capacity of 600t at 20m. The vessel will be fitted with Kongsberg K-Pos DP-22 dynamic positioning system and two cJoy compact joystick control systems. It will also feature a double-joint factory with five line-up stations and two stations for internal / external welding purposes, a main firing line with six welding stations for double joints, a non-destructive testing station and six coating stations. A helicopter deck will be provided to support the operations of a single rotorcraft. "Originally christened Pieter Schelte, the vessel was renamed Pioneering Spirit in February 2015." The bow and stern sides of the vessel will feature two Kongsberg K-Bridge navigation bridge systems installed with multi function displays (MFD). The systems will employ new radar transceiver technology to transfer signals of eight radar transceivers on a local area network (LAN). The systems will also integrate modern features such as the capability to compound radar images from multiple transceivers by presenting them as a single composite image, which will avoid blind spots and offer a 360° view around the ship. A communication network aboard the vessel will combine the dynamic positioning (DP) system, thruster control, and navigation and machinery automation systems into a comprehensive solution offering unique positioning and manoeuvring capabilities in complex operations. The vessel will also be fitted with subsea position reference systems including a high-precision acoustic positioning system from Kongsberg Maritime. The systems will assure the accuracy of the onboard DP system. Pioneering Spirit will be powered by eight MAN 20V 32/44 generator sets and a 9L 32/44 engine. Diesel gen sets, with a total installed power of 95,000kW, will drive 13 azimuth thrusters ensuring dynamic positioning and propulsion. Thrusters will be capable of rotating 360° to propel and position the vessel. Rolls-Royce was awarded a contract for the supply of 13 large azimuth thrusters for the vessel. The £18m contract is the biggest thruster order received by Rolls-Royce for a single vessel. The propulsion system will provide the vessel a maximum speed of 14kt. ROMAGNOLI Marine Solutions is an Italian company that develops, manufactures, markets and maintains everything concerning winches and deck machinery for marine and industrial applications.